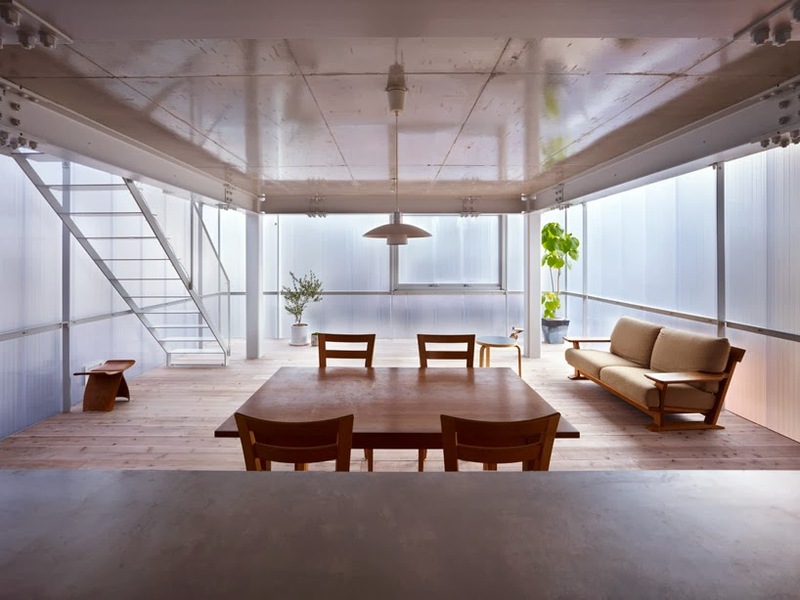 This 3 Bedroom 3 Storey House in Tosuien, Hiroshima, Japan, designed by Suppose Design Office for a family of five. 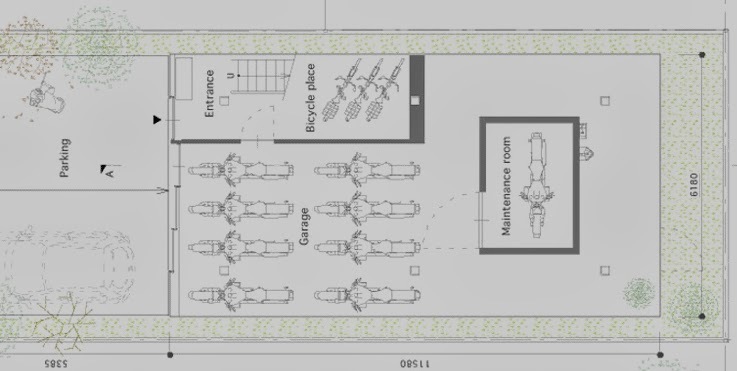 The article contains Floor Plans to give a better idea of the layout. The building is recessed 4m (13.1 feet) from the street, giving the owners a lot of space for parking. More information in the Article. 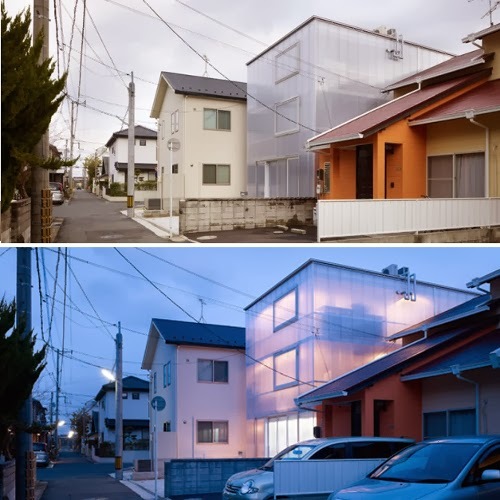 This house really stands out for its design and unique look. 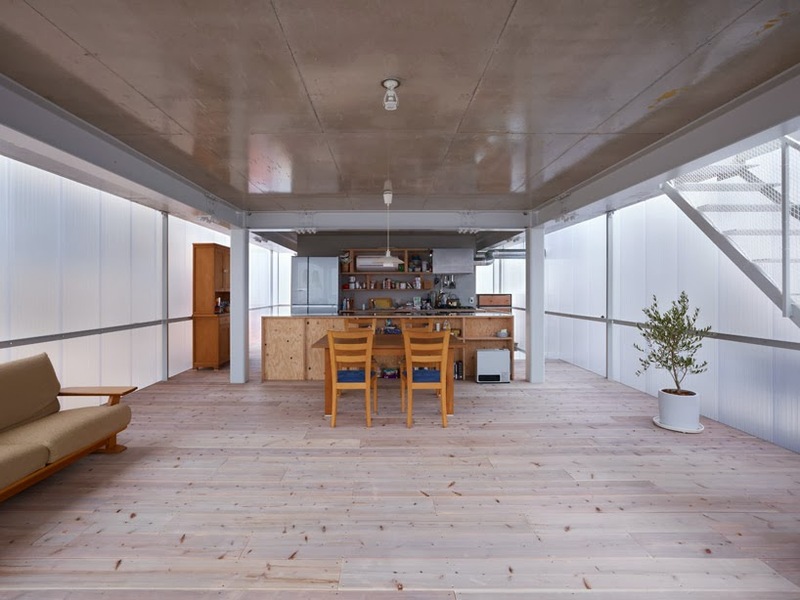 The building has a Steel Frame with concrete floor that house the the plumbing and mechanical services. The only thing I question is how warm is going to be in the winter and are you going to have to spend a lot of energy, money, heating it. The one thing you will not complain about, in this house is lack of light. 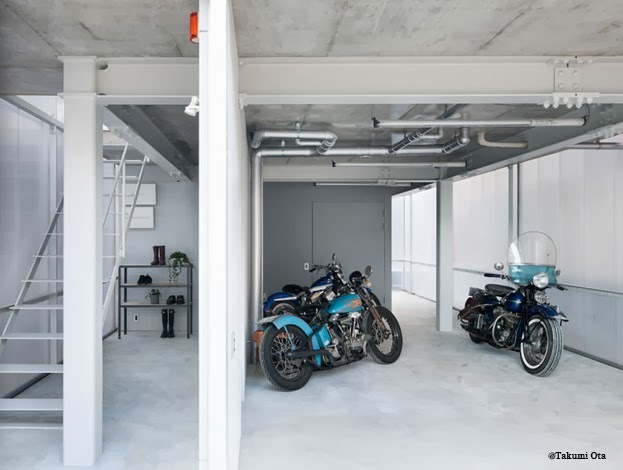 The ground floor was tailor made for the Father, as a motorcycle enthusiast, most of it is taken up to service his hobby, with a maintenance room for the bikes at the back. The First Floor is the family space, with the Living Room, Kitchen, Bathroom and at the back a Powder Room space. It seems strange to have a separate space for the Powder Room, making the WC into a Bathroom, on the Second Floor would release extra space on the First Floor. The other area, the Kitchen Dining and Living area seem to work well. 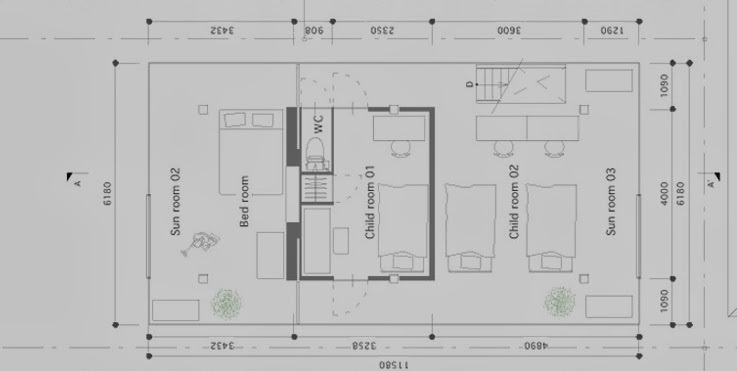 The Second Floor comprises the Master Bedroom, an enclosed child’s room, a small WC (that seems not to have a sink), and an open space that is used for the other two children. 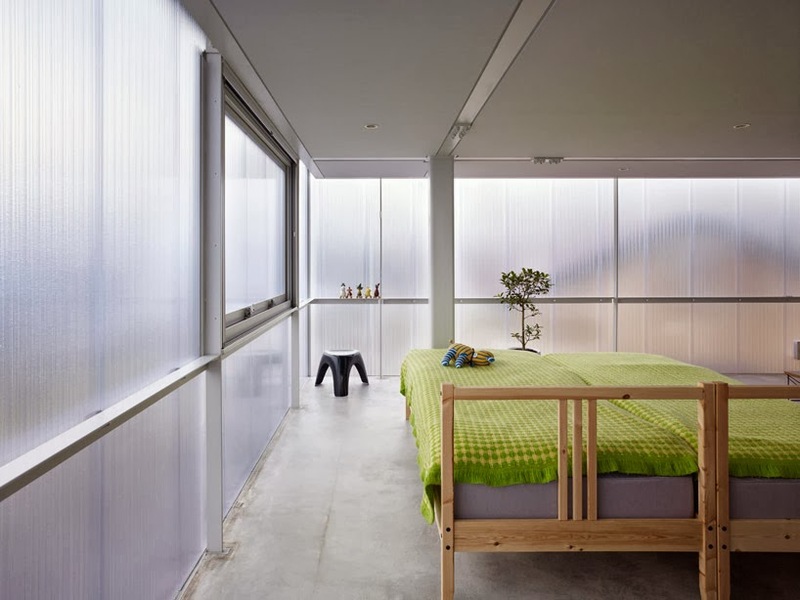 This is a bit of a funny layout as the child’s Room 1 is in the middle of the floor forcing corridor space on both sides, space that could otherwise be used in another way. Furthermore having 2 doors in the room means less wall space for storage, cabinet space etc. See the floor plans for more explanations of the Layout. The house looks very different from the Architecture that is out there at the moment, it is a very light deign outside and inside, but I don't know if this is enough. As I said before I don't know if the walls provide good thermal insulation. If it doesn't, that means that in the summer you will have to spend a lot of energy cooling the house and in the winter, a lot of energy to heat it. 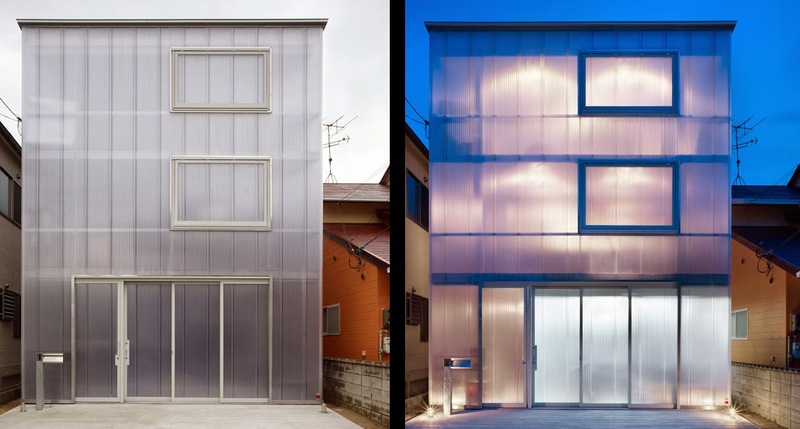 There is another factor to consider, the translucency, the designers say that if you stand 1 meter (3.2 Feet) away from the walls, people from the outside would only see a distorted image of you and the further you go, the less you are going to see. Is that something you would put up with, to live in a place like this? In my opinion, and that is just that, my opinion, some strange choices have been made in the design and layout. 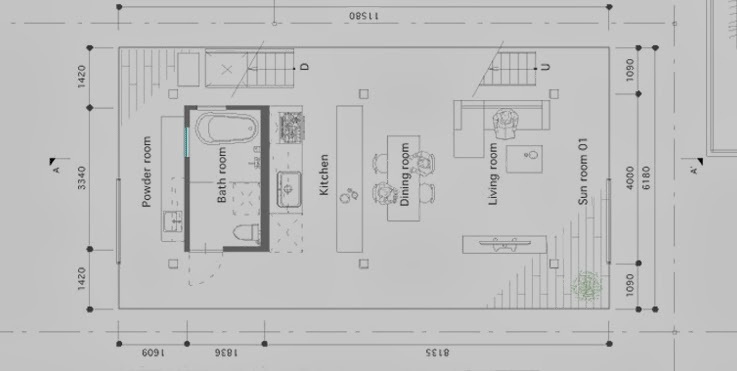 As I have talked about above, the Bathroom / Powder Room layout, the small WC on the 2nd floor that could be bigger and maybe have a shower, down to the positioning of the master bed. You might think that it is a really small thing and easily moved, but it highlights some of the strange choices made, why put the the head of the bed away from the wall, not allowing easy access to the right side of the bed. Have a look at the second Floor Plan to see what I mean.